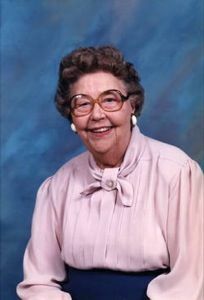 Mrs. Lucile Jones Boyce age 101 of 490 Old Camp Road, Wallace died Wednesday, June 24, 2009 at Pender Memorial Hospital in Burgaw. Funeral Services will be held at 2:00 pm Saturday, June 27, 2009 at Rockfish Presbyterian Church conducted by Rev. Simon Scott and Rev. Charles Love. Burial will follow in Rockfish Memorial Cemetery. She is survived by one brother, Leadie Jones of Willard; two nieces, Barbara Rogers of Nashville, NC and Wanda Powell of Wallace; and one nephew Richard Jones of Florida. A native of Pender County, Mrs. Boyce was the daughter of the late Joel Jones and Caroline Cottle, and preceded in death by her husband Richard Boyce. Casket Bearers will be Harvey Knowles, Franklin Williams, Mike Knowles, Jimmy Young, Lee Dail, and William Wells. The family will receive at their residence 1021 Church Street in Willard.